...and I wanna play the game with you. You may be mistaken for thinking these items may be about to feature in a 2015 version of the Generation Game (where a varied assortment of items were placed on a conveyor belt that the contestants would have to memorise them to win the prize). No. These items signify the arrival of that good old time of year again. Roll up. Roll up. It is the National Student Survey. The National Student Survey (NSS) in the UK started in 2005 and asked university students in their 3rd (mostly final) year of study series of questions relating to the experience on their chosen course (NSS, HEFCE 2005). The survey was intended to measure the ‘quality of higher education’. The questions have largely remained unchanged, and the most acclaimed and most likely to break vice chancellors out in an uneasy sweat is Q22 “overall how satisfied are you with your course”? The survey has been modified over the years and now includes additional questions for NHS based courses. The data presented is subject to a number of benchmarks and adjustments. The survey was launched early on to a fair amount of resistance, questioning the poor style of analysis that bundles the data together and reduces the clarity of results, relying on broad and unspecific questions, and quite worrying on the back of this, that universities subsequently making important strategic decisions based on the outcomes of the survey (Jumping through hoops on a white elephant, 2008). Is experience becoming more important than education? The survey, despite these early robust discussions, has not gone away, and quite to the contrary. Whilst the survey itself remains largely unchanged, the resourcing and time investment by institutions to ensure an effective process for collecting responses is now a significant activity in every academic calendar. It is part of the ‘business’ of Higher Education and feeds the growing appetite of the sector for key performance indicators, data, league tables, frameworks, benchmarks, as we all set to the business of ‘measuring’ what education is. Couple this volume of work with poor data management systems, the increasing need to deliver and duplicate this data in a variety of forms to other places, the administration and teaching teams within universities are not surprisingly under huge pressures and experience unhealthily long working hours (UCU 2014 Survey). As with other areas of the public sector, I’m sure we’d much rather spend our time educating young people, and do the job we were initially intended to do? Aren’t there bigger problems to solve? Like an academic arms race. Add the shoe sizes of VC’s into league tables! Would be just as accurate. I am optimistic we are on the verge of one brave institutional leader saying enough is enough. So does it provide a useful view of the quality of education? What do people think? I don’t doubt at all that prospective students and their families should be better informed about the performance of their institution to which they might be making a considerable and hefty commitment to. However are league tables the best way of doing it? I would question whether people read or indeed understand the increasing numbers of them. Having spent 12 years doing open days at three different universities I can honestly say I cannot recall it being a subject of conversation once. University choice is about gut feel of a place, it is about coming to an open day and meeting great existing students, academic and technical staff. If anyone makes a decision based on the position of a university on a table alone, they must be pretty mad. But what do people really think, and going back to the cuddly toy, are incentives wrong? Incentives are an established means in market research for improving response rates and quality of responses to questionnaires. You might think they naturally bias responses toward being more favourable? Research shows this is not always the case, but the optimum incentive point must be found, otherwise the opposite can happen, and respondents start to get pretty naffed-off. One way to minimise any bias would be to get students to complete the survey independently of their univeristy – they complete the ‘Destination of Leavers from Higher Education’ – graduate employment – survey 6 months after leaving, so why not the NSS? Why not manage the survey centrally via the student union to relieve the burden on the teaching teams? Taxpayers deserve more open, fuller accountability by this sector because of the huge amounts now spent and the financial burden put on our young people. Still, I remember my uni days fondly and would encourage anyone to seek out a uni experience and screw the untrustworthy rankings. You can read the conversation for yourself. (BBC, Universities face survey warning, 2008). What about the meaning of the data? So what do we really know about the meaning of the data? Do we every really sit and question it? All the data is openly retrievable with data sets going back to 2005 on the HEFCE website (http://www.hefce.ac.uk/whatwedo/lt/publicinfo/nss/data/2008/ ). This is the approach I took to looking at it in this first instance. 1) I downloaded all the Higher Education year datasets to an Excel spreadsheet. 2) I looked at the ‘registered’ data as opposed to the ‘taught’ data – data being responded to the institution at which the student was registered rather than where the majority of teaching may have been. 3) I manually corrected the variation in university names over the years, and included the latest name for those institutions that had been renamed. 4) I sorted the data by institution to allow for comparisons across each year. Work by Paula Surridge (http://www.bristol.ac.uk/esu/ug/nss/research.html ) informed the use of benchmarking, adjusting for subject, ethnicity, age, mode of study, gender and disability. It does not adjust for socio-economic group which on the surface is rather surprising. In 2008, the benchmarking changed, so comparing to data prior to that is not terribly useful. Figure 1. 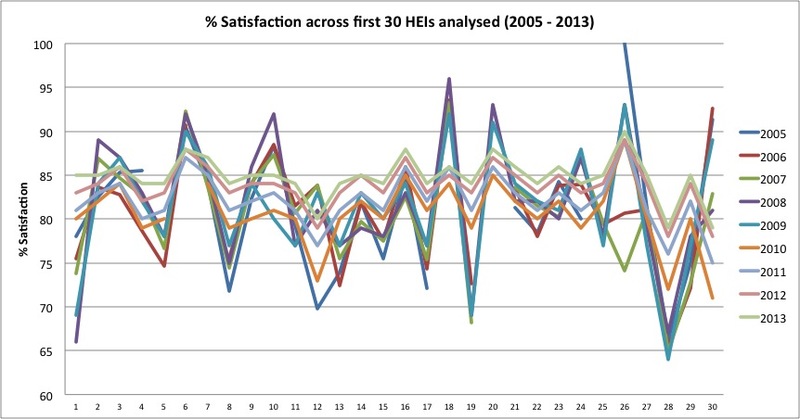 Overall % Satisfaction looked at across 30 HEIs from 2005 to 2013 to illustrate the change in benchmarking in 2008 and subsequent compaction of the data. HOW SATISFIED ARE STUDENTS ACROSS THE UNIVERSITY SECTOR? When I first plotted this out by arranging the HEIs in England alphabetically, I thought it looked pretty and rather interesting. My partner thought it looked like the German world cup football strip. My statistician, who I gave the data blinded, observed “clearly some pattern and cyclical event going on”. I enlisted the help of a second statistician to analyse the data. Performing an ANCOVA to compare year on year differences, there were significant differences between each year group with the exception of 2013 to 2014. Each institution was incrementally better year upon year until 2013 when there was another benchmark change. Conclusion? 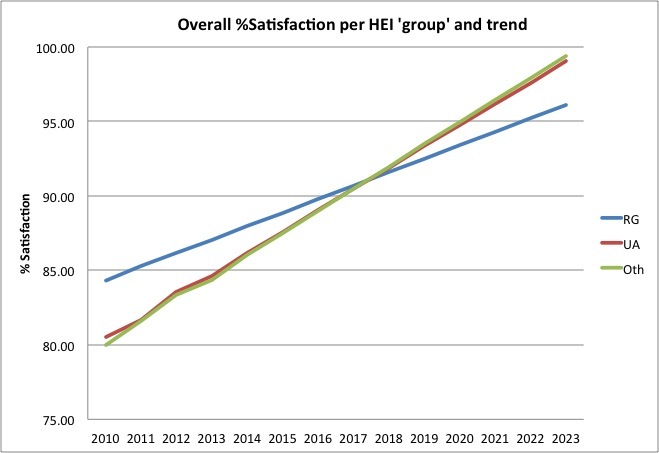 The data suggests students are more satisfied year on year with the HEIs in England. Or, are the processes to gather the data are improving year on year? HOW DO THE DIFFERENT UNIVERSITY GROUPINGS COMPARE? Data was sorted according to Russell Group, Alliance University or other. By sorting universities in England by their commonly referred to groupings, and extrapolating the dataset, the Russell Group clearly achieve higher satisfaction rates compared to Alliance Universities and all others. The data does however show their rates of satisfaction slowing down. Should the benchmarking remain unchanged, by 2018, the UA and other will match the performance of the Russell Group. By 2023 the ‘others’ nose past the winning post being the first to reach 100%. Improvement in satisfaction or processes? It is not clear what the nature of these observations really are, and with all my discussions on the data, there are some interesting hypotheses. I hope this article prompts some serious data analyst to interrogate the data sets more fully. I have done the same analysis on other questions – and there are interesting differences with those also. But do we see this elsewhere? In the 2014 REF the sector seemed to incrementally improve with suggestions that the evaluation is flawed (The Guardian, REF 2014), and whilst we cannot doubt the amazing and outstanding work that does go on in UK universities, we could say that this was also due to also improvements in the system. One thought that has come up a few times is that we are dealing with a system that is corrupt – and by human nature if you set us targets and measure our performance, we will work to comply with those targets. We all know that is exactly what happens – how do we spend much of our academic time? I do think the HE sector needs to take a good look at itself and understand fully the series of measures and targets to which our performances are increasingly evaluated (research, students satisfaction, teaching performance). If we do persist in having monitoring systems, they have to be run effectively. We are detracting academic staff from doing their jobs, and the pressure on teams do get good results, as we’ve see with the REF can develop a sinister side (The Guardian, REF 2014). Higher education is not a theme park delivering a jolly experience. It should be nurturing and at times challenging one to enable learners to develop and achieve meaningful goals, and I would therefore at times be quite happy if my students at times were left a little unsatisfied because I had chosen to stretch their thinking and their approaches. This entry was posted in Blog, Learning & Teaching, National Student Survey and tagged National student survey, NSS by admin. Bookmark the permalink.